All markets that report volume data. 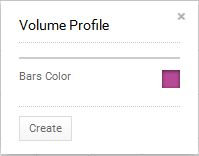 You can select colour for the volume profile plot a by selecting the bars colour box to bring up the colour palette. The more times support, or resistance area is touched by price, the stronger it becomes. However, the same is true for volume at that price level. By combining price and volume the user can quickly identify strong support and resistance zones on the chart where demand or supply are likely to swell in the future. The chart of Westpac shows three heavy areas of volume at high, medium and low prices. Clearly, the lowest price zone was the strongest so if prices do start to rise there will likely be strong demand at that price level.